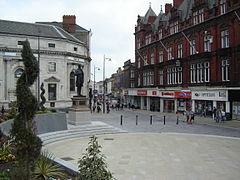 Darlington – dystrykt o statusie borough i unitary authority w hrabstwie ceremonialnym Durham w Anglii. W 2011 roku dystrykt liczył 105 564 mieszkańców. Archdeacon Newton, Barmpton, Beaumont Hill, Bishopton, Blackwell, Brafferton, Coatham Mundeville, Cockerton, Denton, East and West Newbiggin, Eastbourne, Faverdale, Firth Moor, Great Burdon, Great Stainton, Harrowgate Hill, Harrowgate Village, Haughton-le-Skerne, Headlam, Heighington, High Coniscliffe, Houghton Bank, Houghton-le-Side, Hummersknott, Hurworth Place, Hurworth-on-Tees, Killerby, Little Stainton, Low Coniscliffe, Low Coniscliffe and Merrybent, Low Dinsdale, Low Walworth, Merrybent, Middleton One Row, Middleton St George, Mowden, Morton Palms, Neasham, Oak Tree, Piercebridge, Redworth, Rise Carr, Royal Oak, Sadberge, School Aycliffe, Skerne Park, Sockburn, Summerhouse, Ulnaby, Walworth Gate, Walworth, West Park, Whessoe i Whinfield.